What is the maximum current that can be supplied to an Arduino Mega board before frying/breaking? Basically i have several components connected to my board which draw a total current of 1.6A (which i calculated through a table), and thinking of using a 9V 2A power supply. 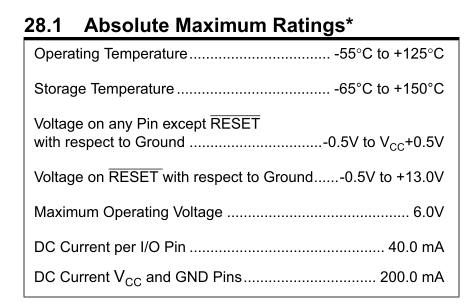 I know that the arduino voltage limit is 7-12V but just wondering about the current as I can't find it on the datasheets? 1A coming in thru the barrel jack connecor, then you risk blowing the 1A rated reverse polarity protection diode. The 5V regulator will overheat at high currents above 7.5V. The chip itself can have 800mA put thru if if properly cooled and the IO limits of current per port are respected. You won't be able to draw 1.6A of 5V from the Arduino. You should probably get a separate 2A 5V regulated power supply for your external components. Again though, your question isn't very clear so I'm not sure I'm answering what you're asking. Not the answer you're looking for? Browse other questions tagged arduino-mega power current or ask your own question.